Hello Sunday Blog Hoppers!! 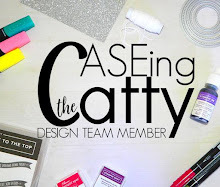 Welcome to our Caseing the Catty Sunday blog hop where we Copy And Selectively Edit from the projects in our wonderful Stampin' Up! Catalogue. And here is my inspiration for this week - page 89 and the cute little stamp set Badges and Banners with the coordinating Duet Banner and Best Badge punches - you have to love a stamp set and punch combo - it just makes crafting soooooo much easier!!! What do you think? I've also gilded the cage with the gold wink of stella pen - fabulous!!! And my card also features the DIVINE Serene Scenery DSP - for the central panel AND the central strip running down the middle of the card. I also love the burlap ribbon bow too - I cut the ribbon in half lengthways to make a thinner ribbon, and then when it was tied into a bow it separated to make a multi bow - love it!!! When I came to complete my card, I couldn't decide between a crumb cake base, or the panel with very vanilla lightly sponged with crumb cake ink. I've just received my new sponge brayers in my last Stampin' Up! order, and wanted to have a go with my new toys...... I think I need more practice, but it certainly worked just fine for this card!! Now it's time for you to keep on hopping away until you get all the way around. Our team is so talented and generously share their wonderful creativity with you so that you can be inspired by our fabulous catalogue over and over again!! 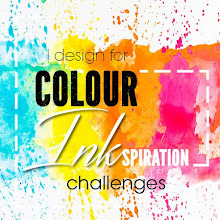 And when you've seen all the great projects, be sure to enter your own project into our monthly challenge by using the link below!! And for a complete list of all of the design team and their blog posts, you'll find them using this link. look great!! love the DSP and the gilding, thanks for the tip about cutting the ribbon in half, such a cute bow. Julia I love your case, I like it better than the one in the catalogue, the colours and DSP you have used look fantastic, thanks for the inspiration! I like I like your version better than the catalogue!! The colours you have chosen are perfect!